I've entered this wonderful, frustrating, world of Photo Montage. Some pieces went together easily, others with a lot of trial & error (& tears!). It's fun when it works. Lovely senorita. 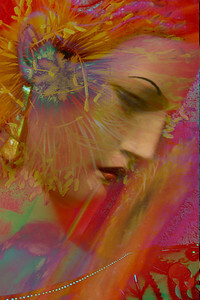 This montage used two photographs, one of a mannequin in an antique shop, the second is a flower photograph. 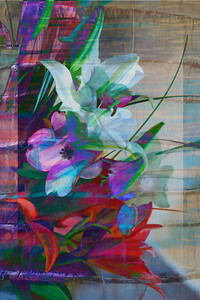 Photo montage, used photograph of flower arrangements and closeup of bark. Blend modes used. Field of flowers. 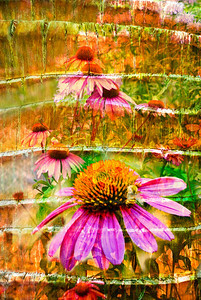 Photo montage: used two photos again, flowers and bark. Blend modes applied at different opacities. Seed pods. 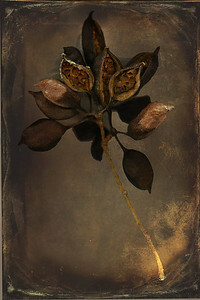 These were scanned on a flat-bed scanner, then used background from Shadowhouse Creations. 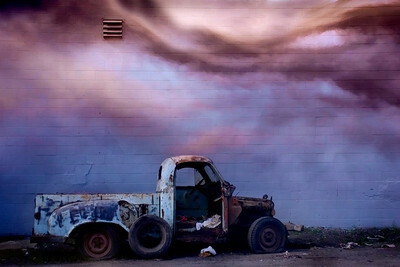 Abandoned truck. The truck was found in an alleyway in Berkeley, left by this cement block wall. I added a photo of the sky taken at dusk (in Reno).